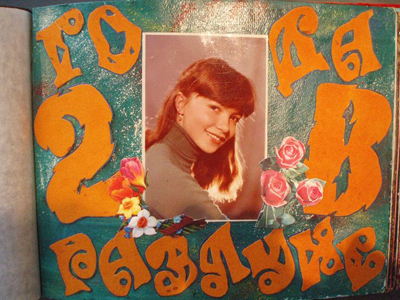 Prepared by Valkova, M.Y., based on open source material. Photos by the author. 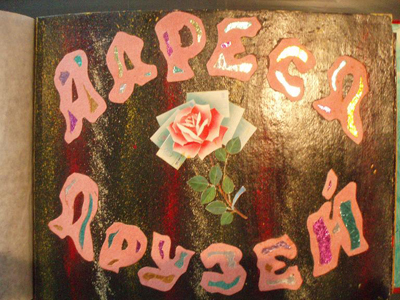 In February of 2008, the Museum of History of the Town of Shlisselburg presented an exhibition dedicated to an imperishable and unique kind of most interesting folk genre – hand-made art album. 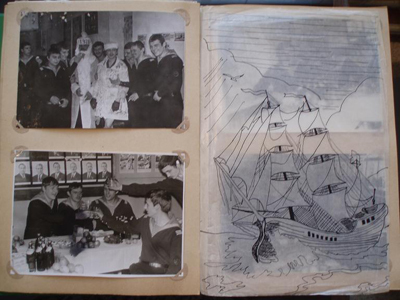 One way of recording memory is creating a home-made archive. 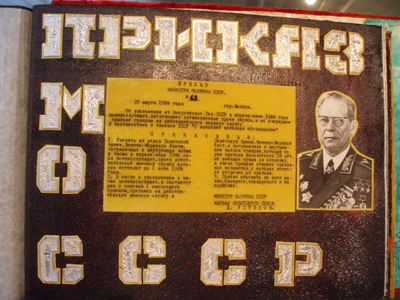 Usually it consists of documents, photographs, newspaper clippings, letters of commendation and other trinkets, close to heart and meaningful to only the owner himself. 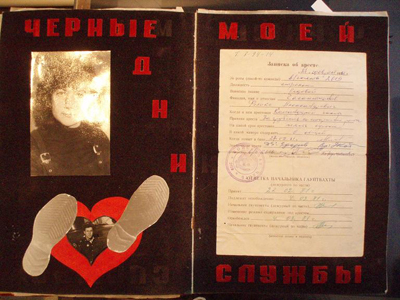 A more artistically organized part of the archive consists of albums – child, school and college graduate albums, wedding and anniversary albums, albums dedicated to an important event or a life period of the owner. Besides albums made by individual owners, they can also be created by designers and photographers - oftentimes random people. Each of the “standard” design elements can be infinitely reproduced and vary only in the name of town, college, school, and owner. Demob is the only form of album that is never generic in its social, psychological, and artistic makeup, and does not become a quick way of making money for a seasonal craftsman. In its content, it is a universal historical and artistic document. Recording the owner’s individual memories, it also reflects the taste of the public, or, more precisely, of a certain cross-section of the society at the time. Album form of expression has always been considered a pop-culture phenomenon. As a rule, it was the domain for dilettantes, amateurs, and the owners themselves, who imitated professional artists or writers, combining drawings, engravings, photographs, and postcards into one book and imparting a sense of organization and meaning to it all. One of artistic advantages of the album form of expression is its individual, hand-made character, akin to contemporary artist’s book. Among all the various kinds of artist's books, Demob album belongs to the category of books represented by a single hand-made copy. In its character and intent, it is the most original of all the existing publication types – it’s a book-album, created by the artist himself and containing his marks, speaking of an important stage of his life (not referring to those albums that are made to order). This type of a book is exclusively a work of authorship - autobiographic and therefore unique. 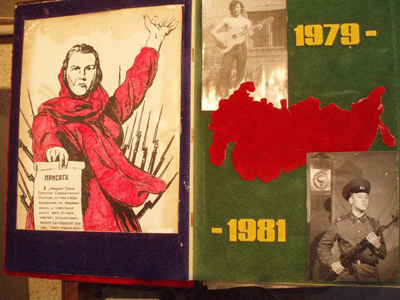 At the same time, Demob album also represents the most radical type of an artist’s book genre. This form of expression is filled with na?ve crudeness, simplicity of a young creator, openheartedness and desire to create a book for all times, a book about oneself – possibly the only one in the artist’s life. This album is oversaturated with art that includes drawings, graphics, photography, collage and sometimes even embossing. Oftentimes, Demob album outgrows the bounds of album form of expression, turning into big art. With its targeting, design, and topic headings, Demob album continues the tradition of the Russian album form of expression that is a little over two centuries old. Over this time period, it grew into a certain artistic and literary genre. In all the time of album art existence, its main topic headings did not change; they are - identification of the hero - the album’s owner (in nobility albums, these were the coat of arms and the motto), identification of the areas of interests, dedications from friends (in a soldier album - photographs of friends and with friends), favorite poems and songs (military songs, orders, excerpts from the military regulations, and the long-awaited text – the Order for release into the reserve). The illustrations also have their established forms – title and ending drawings, military accessories and heraldry, entertaining graphics reflecting the esthetic mindset of the society. In the Demob album, we see decals with portraits of various beauties and stickers displaying contemporary Naiads and Venuses. Demob album, recording an important life episode and expressing the society’s point of view of the social medium, everyday life, upbringing, and culture, often takes up artistic form. Demob album is a document testifying to a youth becoming a man - a man’s certificate of maturity. This album is varnishing memory of the most important challenge in life. Demob album is an epical creation, a manifestation of the soldier's spirit, willpower, intellect. The hundred days prior to the Order of release are dedicated to velour paper, golden foil, embossing, collage, gouache paint, color pencils and photography - na?ve and sincere creative work. 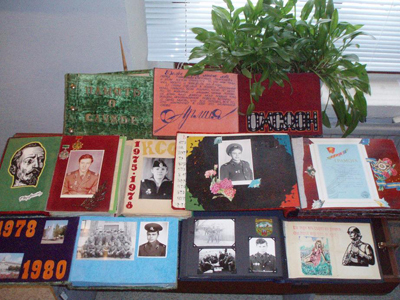 Album expresses a feeling of reserved strength, pride, heroism that we associate with an image of the Homeland defender. 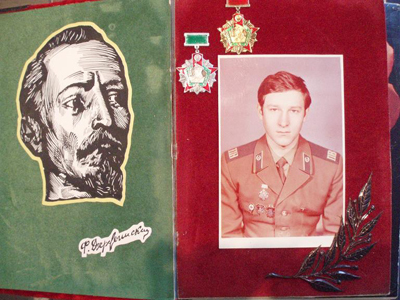 In this materialized memory, the artist of the Army tells us about the most important things; he distances himself from the everyday and the commonplace, glorifies the military brotherhood, loyalty to friendship, faith and duty. Demob album paradigms took shape over decades. 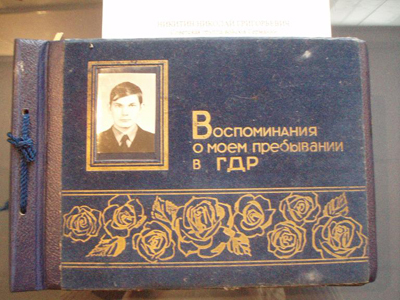 The topic headings - “Commemoration to the Service”, “Always with Me”, “730 Days for the Homeland” (in the Navy, it’s 1096 days), “The Order of the Ministry of Defense”, and “To Those Who Serve” - reveal its visual and literary content. Demob album contains the following types of fine art: photography (portrait, genre scenes, landscapes, interiors), graphics (section title design, illustrations, ink and colored pencil drawings), watercolor, calligraphy (signatures and texts), painting (pasted sketches - oil and gouache on cardboard), collages. Section titles were made exclusively of bright-colored velour paper, silver and golden foil. 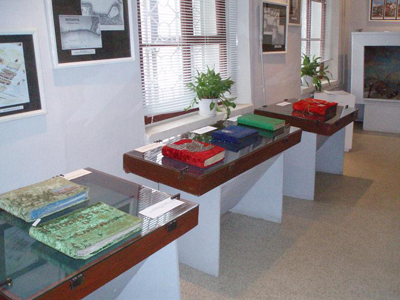 The art of bindery reached extra heights. Military overcoats, naval pea coats, tunics, camouflage cloth and, of course, orange and red plush were used for binding material. 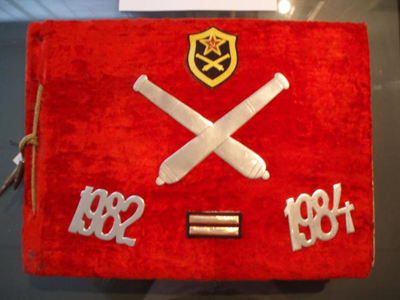 Top covers were decorated with military accessories, embossing, metal cover plates, and various inlays. The place where the binding edge attached to the cover was sometimes accentuated with rifle or machine gun cartridges. 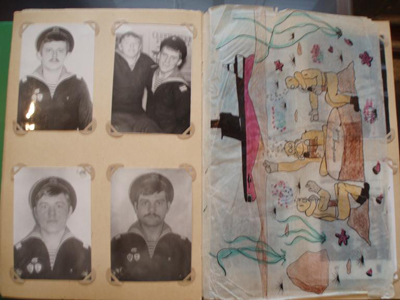 All of the artistic ardour and ingenuity went into decorating the binding and the cover. The richly decorated cover of the Demob book traces back to traditions of the nobility’s album of the first third of the XIX century, when leather, ornamental embossing, bronze cover plates and fasteners were used. In both types of albums, album cover not only fulfilled a practical function of protecting the album block, but gave character to the album itself. Design of the cover is what allowed the artist’s individuality, or lack of thereof, to manifest itself. 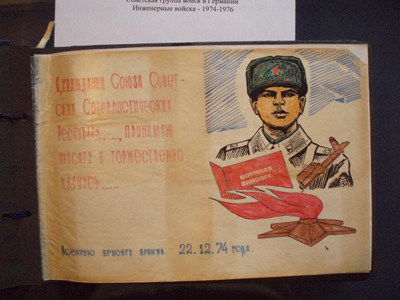 Standard album blocks, specially produced by mass manufacturing for the Soviet militaries serving their international duty in Eastern Europe, embodied a more generic and unified decoration. These albums, same as postcards with city views, color stickers, pennants, and bar stamps, could be purchased at army stores. The backbone of the illustrations in a “Demob” album is photography – gallery of portraits. 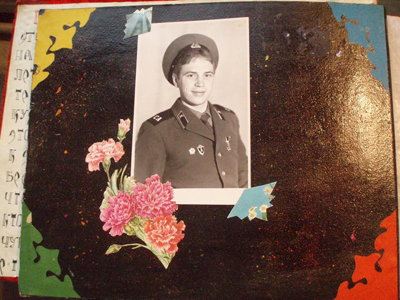 A certain iconography of the soldier’s portrait has been developed – portrait from the waist up, portrait from the chest up, portrait in formal military dress, portrait with a friend, etc. Character and design solutions were connected not only to the branch of the army the artist belonged to, but also with the stationing location. Ethnic culture of the artists played important part in the choice of ornaments and design. 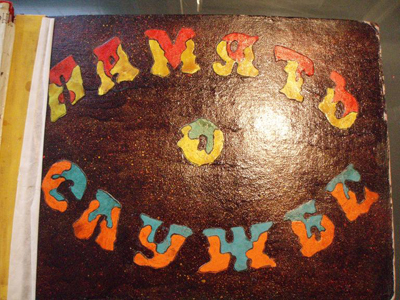 In its artistic culture, flexible language, and na?ve form, Demob album is similar to folk paintings. Folk paintings were particularly expressive and socially demanded during the time of war, raising people’s spirits and mocking the enemy. 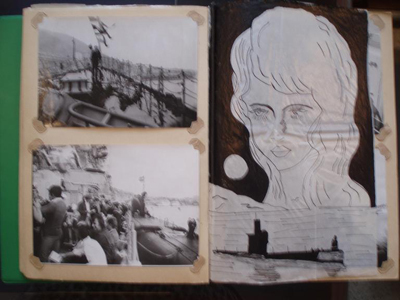 Demob album reflects the amateur and openhearted character of the army artists who, as a rule, were not “spoiled by academic education.” Sailor’s drawings are particularly idealistic and naive – depictions of mermaids, beauties, sailing-ships, the sea and sunsets, resembling tattoos with their graphics. 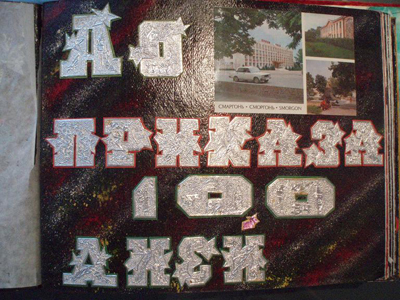 The expression of contemporary folk culture and folk art is what allows to regard the Demob album as a kind of Art Brut, or, more precisely, Russian Art Brut – a unique phenomenon in the artistic culture of the world. With time, these albums will become as rare a document testifying to the era as are the nobility albums and albums of the XIX century officers, and samizdat, the hand-written and typed form of it, today. 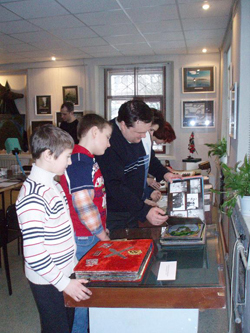 Author would like to express his gratitude to N. Mikhailov and Y. Zelentsova, Kirovsk Regional Administration officers, for their help in organization of the endeavor, and to the album owners -Vokhmintsev, S., Galaktionov, F., Isaev, A., Krasnov, O., Peregarov, A., Nikitin, N., and Platonov, V.